Me + Salad = lifelong preoccupation. This is not news. My salad fixation has been well documented here on Foodie with Family. (Every one of those words is linked to a different salad recipe here and that’s just scratching the surface… Obsessed much? Why yes.) I just love the textures and crunch and dressing and, well, all of it. 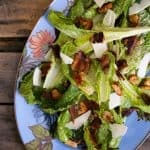 When I shared my Jerk Bacon recipe a couple of weeks ago, I mentioned that it was inspired by my favourite brunch offering on the Carnival Cruise lines; Jerk Bacon Caesar Salad. It’s kind of ridiculous how completely obsessed I am with this salad. It’s pretty much the most perfect salad in my vast repertoire of salads. 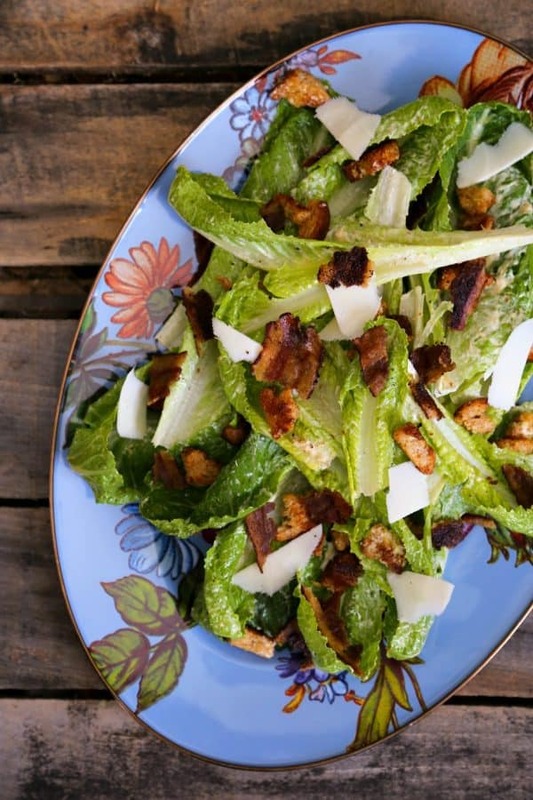 Jerk Bacon Caesar Salad takes the classic and familiar Caesar salad and delivers a flavourful kick in the seat that makes it so memorable. Yes, I ate this for brunch at at every opportunity, and I continue to put this on my table at least once a week, but I’m nowhere near tired of it yet and neither are my guys. I’m not quite putting Jerk Bacon Caesar Salad in the “entrée salad” category -even though it’s hearty- because the jerk bacon is an accent rather than a substantial part of the salad. HOWEVER, if you were to serve Jerk Bacon Caesar Salad with some grilled chicken, fish, or pork on the side, and a nice crusty bread, you’d be home free. Conversely, if you served Jerk Bacon Caesar Salad with a crusty roll or a handful of olives, that’s a perfectly wonderful lunch. In fact, it’s a lunch that would guarantee me to show up at your house with a fork. Not that I’m stalking you. It’s your salad I’m stalking. 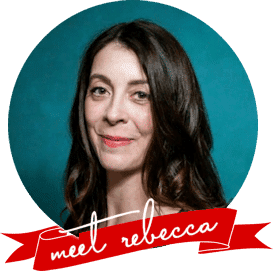 I’m not going to tell you not to make Jerk Bacon Caesar Salad with bottled Caesar dressing, but I AM going to tell you it’s worth the effort to try it at least once with homemade Thick Caesar Dressing. 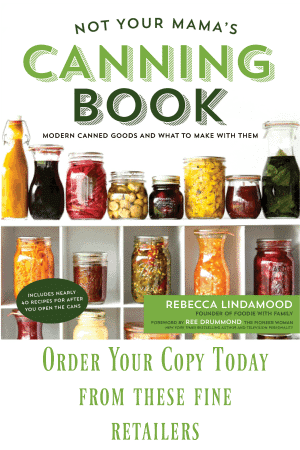 It’s fairy godmother type of magic for your salad. 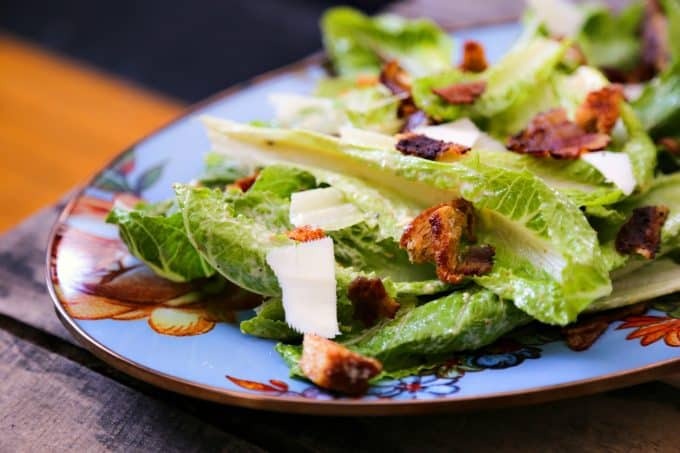 I’m also not going to tell you not to make Jerk Bacon Caesar Salad with bagged or boxed croutons, but I’m definitely going to mention that if you want to really up your salad game, you’re going to want to try homemade Torn Croutons. Those are extra unicorn level magic. Jerk Bacon is super simple to make. Use this recipe for best results. Because this salad is dressed before serving, it doesn’t hold over very well. Make just as much as you plan on eating at a meal. It’s better to have to run back to the kitchen to make a second salad than it is to have sad, wilted leftover salad. Toss the whole romaine leaves with the Caesar dressing, using your hands to work the dressing into all the crevices of the leaves. Toss in the croutons. Arrange on plates, break the Jerk Bacon into bite sized pieces and scatter over the top. Finish with the curls of Parmesan cheese and serve immediately.